Dog Walking Services Irvine and Newport Beach by CiaoCiao PetCare. CiaoCiao PetCare Dog Walking Services Irvine and Newport Beach. Give yourself the peace of mind and convenience of counting on a trained, familiar, full-time dog walker & long-time local business owner. Meet your dogwalker personally in a complimentary meet & greet at your home. Try CiaoCiao PetCare Dog Walking Services! An Active Dog is a Good Dog. Your dog needs mental stimulation and exercise to be well-rounded and well-behaved. Left alone, dogs get bored and come up with their own creative ways to entertain themselves, no matter if this means chewing up shoes, digging holes in the backyard, or yapping at anything that moves by. Our brisk walks are just the thing to tucker out your dog. A Tired Dog is a Healthy Dog. Your dog needs daily exercise to stay fit and healthy. Under-exercised dogs often are overweight, and packing the pounds increases the risk of chronic diseases like arthritis and diabetes, that often shorten a dog’s life. Our dog walking services tailor the level of our walks’ activity specifically to your dog’s needs. So you have more years of life and love to spend with your dog. This Land is your Land, but I’m Going to Pee on It. Your dog needs a variety of sights, smells and sounds every day to keep his mind engaged. We spice up your dog’s day by walking over a diverse set of trails, streets and parks in your neighborhood. So you focus on your job knowing that your dog is out walking and having a blast. A Great Alternative to Dog Daycare, Without You Having to Drop Off and Pick Up Your Dog, or Pay Extra for Shuttle Service. With our dog walking services your dog will meet other dogs from your own neighborhood and make friends. Our service includes picking up and dropping off your dog safely at your home in a comfortable passengers van at no extra cost to you. We Put Safety First Without Compromising on Fun. We limit our walking groups to a few regular dogs, so we can choose and match them carefully, and we can pay each dog the attention he needs to stay safe and have fun. You Have the Peace of Mind and Convenience of Counting On a Trained, Familiar, Full-Time Dog Walker That You Meet Personally in a Complimentary Meet & Greet. Being able to count on the same dogwalker means that you have the peace of mind that your dog is in safe hands, and that he is happy to walk with a familiar person that knows him inside out. It Takes Skills to Handle Dogs Safely. That’s why you need a trained dog walker that knows how to handle dogs and common behavior issues safely. Learn More About Livia’s Dog Handling Skills and Her Credentials. Specialized in Socializing and Walking Multiple Dogs. Most dog walkers don’t have the skills to handle more than one dog at a time safely. Livia instead is trained in socializing and walking multiple dogs, and knows how to do so safely. Balancing Safety and Fun. To avoid the tragedy of a lost dog or a dog struck by a car, two all-too-common outcomes of off-leash walks, all walks take place on- leash. Teaming up with Your Dog Trainer. 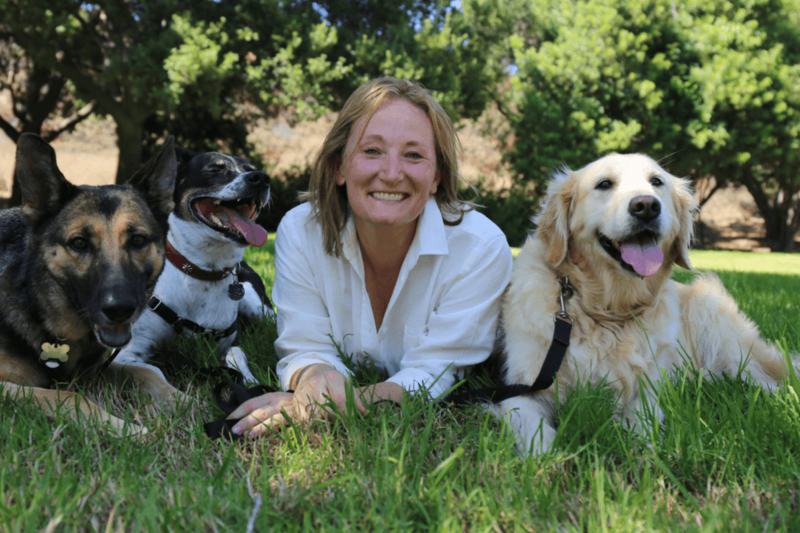 If you’re working with a dog trainer, Livia will reinforce your dog training plan on walks for faster progress. Does your dog love to meet other dogs? With our group dog walking services your dog will look forward to walk with his friends over a diverse set of trails and parks in your neighborhood. A great alternative to dog daycare without having to drop off or pick up your dog, or pay extra for shuttle service. Say ‘goodbye’ to guilt on long work days knowing that your dog is having a blast and is in safe hands. Come home to a well-behaved dog. Do you want the peace of mind of counting on the same trusted person to take your dog on walks? Tired of getting yet another notice that a new walker will come into your home? With our one-on-one walks you have the peace of mind that the same full-time walker is available for you when you need assistance. Our brisk walks are just the thing to tucker out your dog. So you come home to a couch potato instead of a hot potato. Do you read taking your dog for a walk because of the pulling and barking as passing every dog is a crisis? Does your dog love to chase squirrels, skaters and the likes? With our engaging one-on-one walks your dog will learn to keep cool and enjoy his walks by practicing calm, focused behavior while walking on leash. No more stressful sneaks around the neighborhood hoping not to run into something worth barking at. ‘Ciao’ is a common Italian way of saying both ‘hello’ and ‘goodbye.’ Originally hailing from Italy and Switzerland, Livia looked for a way to incorporate a bit of her native tongue into the name of her service. As each day begins with picking up her canine charges for a fun-filled excursion (‘hello again!‘), and ends with dropping them safe and tuckered out at home (‘goodbye for now!‘), CiaoCiao seemed the perfect fit. Do you want to count on the same trusted dog walker over an extended period of time? Do you have a dog that is difficult to walk on leash? Do you have a variable schedule or need your dog to be walked on short notice? Call Livia at CiaoCiao PetCare for the peace of mind you need. 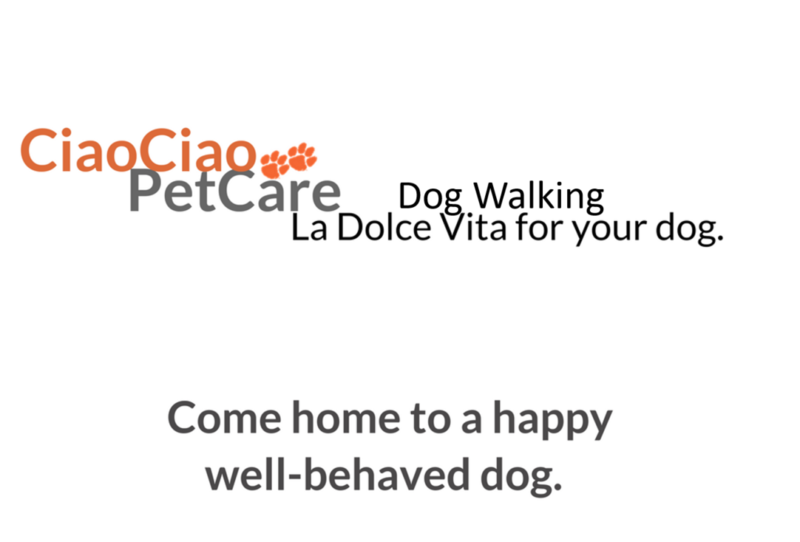 With CiaoCiao PetCare you will always get the same reliable dog walker, Livia, and you will personally know who walks your dog and comes into your home when you cannot be there. I am professionally trained to safely handle dogs of any breed that are difficult on leash, including large and strong dogs that pull, or dogs that are not well-socialized. Providing the best care for your dog is the heart of my business and is based on the trust you give me. Give me a try, and you will come home to a well-behaved dog! It Takes Skills to Walk Dogs Safely. If you own a large, strong dog that is hard to control on leash and can cause serious injuries, your dog's safety and your financial liability are critically dependent on the skills of your dog walker. That's why your dog walker's skills are an asset to you. I am trained on how to safely handle issues commonly encountered when walking a dog on a leash, like pulling, lunging. chasing, scavenging, barking, ect. and the peace of mind I can provide to you is invaluable. Learn More About Livia's Skills & Credentials. Specialized in Socializing Dogs. Most dog walkers don't have the skills to safely handle at the same time two dogs from two different households. Instead, I specialize in socializing dogs, and I've been trained on how to safely match them, introduce them, and walk them together safely on leash. Balancing Safety and Fun. To avoid the tragedy of a lost dog or a dog struck by a car, two all-too-common outcomes of off-leash walks, all walks take place on leash. Teaming up with Your Dog Trainer. If you're working with a dog trainer, I will reinforce your dog trainer's plan while walking your dog, so your dog will benefit from a consistent set of rules and make faster progress. An Active Dog is a Good Dog. Your dog needs exercise to be happy and well-rounded. Left alone dogs get bored and come up with their own creative ways to entertain themselves, no matter if this means chewing up your shoes, digging holes in your backyard, or yapping at anything that goes by. My brisk walks are just the thing to tucker out your dog, so you come home to a couch potato instead of a hot potato. A Tired Dog is a Healthy Dog. Your dog needs daily exercise to stay healthy. Under-exercised dogs often are overweight, and packing on the pounds increases the risk of chronic diseases like arthritis and diabetes that often shorten a dog's life. I tailor the level and type of activity of my walks specifically to your dog's needs, so your dog stays healthy and you have more years of life and love with your dog. This Land is your Land, but I'm Going to Pee on It. Your dog needs a variety of sights, smells, and sounds every day to keep his mind active & engaged. My walks over a diverse set of trails and parks in your own neighborhood will spice up your dog's day, so you can focus on your job knowing that your dog has a good time. A Great Alternative to Dog Daycare, Without Your Having to Drop Off and Pick Up Your Dog, or Pay Extra for Shuttle Service. If your dog likes to meet other dogs, my group service gives your dog the chance to meet dogs from your own neighborhood and walk with the same few friends regularly. And I safely pick up & drop off your dog at your home using my comfortable passenger van, at no extra cost to you. We Put Safety First Without Compromising on Fun. I limit my walking groups to the same few dogs carefully matched by personality and energy level, so your dog gets the attention he needs to stay safe and have fun. You Have the Peace of Mind & Convenience of Counting On the Same Trusted, Professionally Trained Dog Walker Over an Extended Period of Time. After meeting me personally, you can rest assured that your dog is in safe hands. And your dog will look forward to walking with a familiar person who knows his likes, dislikes, and even knows his quirks. 'Ciao' is a common Italian way of saying both 'hello' and 'goodbye.' Originally hailing from Italy and Switzerland, Livia looked for a way to incorporate a bit of her native tongue into the name of her service. As each day begins with picking up her canine charges for a fun-filled excursion ('hello again! '), and ends with dropping them safe and tuckered out at home ('goodbye for now! '), CiaoCiao seemed the perfect fit.